Providing at a Glance a Complete Picture of the Coolant System's Overall Health & Condition. A water cooled conversion would not be complete without proper instrumentation. Designed from the ground up, this new cooling system analyzer not only shows coolant temperature, but also displays coolant pump output pressure and has three warning light indicators signaling: low coolant condition, high temperature, and low pressure and it can be linked to external aural warning systems. Although our Cool Jugs liquid cooled conversion is designed to be as reliable as possible we wanted to provide the earliest possible warning of any potential failure in order to offer the greatest amount of decision making time possible for a pilot. The simple matter is that unlike an oil leak - a coolant leak is virtually invisible and we understand that it isn't practical to fully de-cowl an engine every time to inspect for any leaks in pre-flight. Our CoolJugs system is designed to prevent the possibility of a major leak however, a slightly loose hose fitting can slowly lose coolant over a long period of time. Our cooling system analyzer will warn if the system loses as little as 8floz. of coolant and will provide a clear health check of the system during runup and in flight. The gauge is designed to fit in a standard 2.25" instrument mounting hole. A separate box containing the driving electronics is mounted in a concealed location behind the instrument panel. 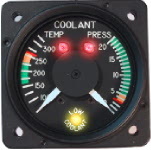 The gauge displays the coolant system temperature and coolant pump output pressure (corrected for system pressure). 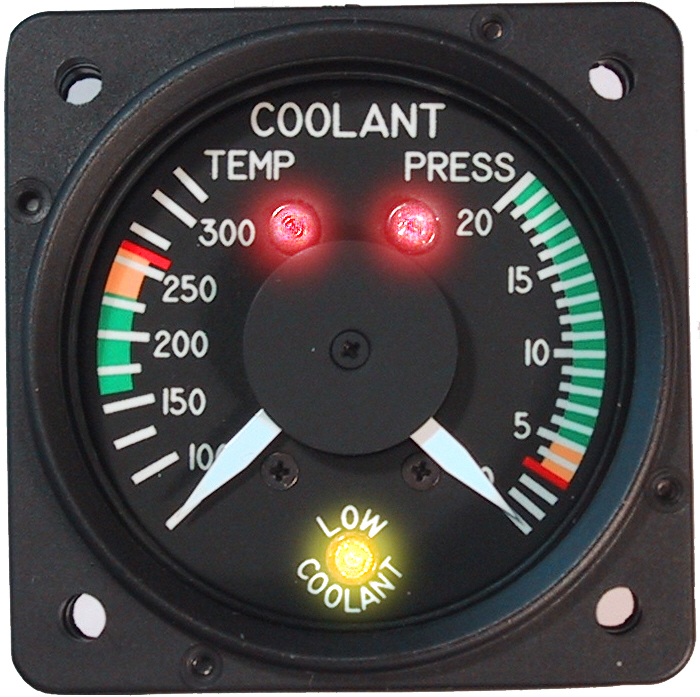 In addition the gauge incorporates warning lights to indicate low coolant condition (yellow), low pump output pressure (red) and high system temperature (red). In addition, electrical outputs are provided for each condition for in order to interface with an external aural warning system. Our cooling system analyzer uses methods so unique that it was awarded US Patent #7,069,883 on July 4th, 2006.